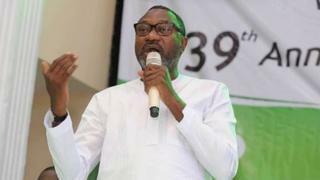 Nigeria billionaire businessman Femi Otedola trend for social medial on Tuesday evening. Tori wey bin dey fly up and down be say di kontri main opposition party, People's Democratic Party (PDP) give Otedola ticket to run for govnor of Lagos State. But tok-tok pesin for PDP for di state Taofeek Gani don come outside tok say dat one na big lie. Im tok dis wan wen im speak wit BBC Yoruba. Otedola na di chairman of Forte Oil PLC, but im neva tok anytin ontop di mata. Yesterday di govnor of Lagos state Akinwummi Ambode tell im supporters say im go run for second term for office.